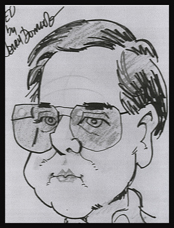 The beginning of any new year is a time for self-refection and resolutions. It is also a great time for a personal brand audit. Dust off your brand promise and objectively assess if you lived up to it or fell short. Evaluate if your promise is still relevant, competitive and authentic. And while you are at it, create a realistic, forward looking plan to improve your personal brand by either deepening or creating skills that enable you to even better deliver against your promise. Throughout my career, I have been advising people to adopt a self-branding mentality. I have found that understanding what you genuinely want to stand for (your brand promise) and taking control of your ability to deliver against that promise is empowering. It shifts the locus of control away from outside factors and puts you in control of your personal journey. My counsel is to view your job as a way to sharpen or create the skills necessary for sustained professional and personal success. This will require you to a) identify the 2 – 3 skills you want to really focus on in the upcoming year and b) determine how your current job and project assignments will give you the opportunity to develop in those areas. In my opinion, the best way to start this process is to create a simple, but powerful chart. It may take you several iterations to get it to the point where you are genuinely comfortable with the choices you’ve made. But don’t lose patience, introspection is tough work. Does creating a chart really make a difference? Understanding what you want/need to learn is the starting point. Often, it also takes a genuine paradigm shift for the exercise to be successful. Take your assigned projects and determine which of the skills each will help you improve. For example, if you are managing the direct mail campaign for your brand it is possible for you to sharpen your project management, financial management, time management, communication skills, copy development skills, negotiating skills, or strategic planning skills (just to name a select few). Define a plan to purposefully develop the skill. If, for example, you had identified financial management as a skill you wanted to develop, then you’d focus on using the direct mail project as the means for learning more about financial management. Your personal development plan might include an exploration of the financial measures that determine success in any communication campaign, a conversation with your CFO to better understand how he/she would evaluate success, an evaluation of the best performing direct mail campaigns your company has executed in the past and why management felt they were great, or authoring a white paper that identifies the top 10 characteristics of a great direct mail plan and presenting that white paper to colleagues in your company. Net, you purposefully decide to learn from rather than simply execute the project you’ve been assigned. If your projects do not provide an opportunity to develop a skill you’ve identified as important, then renegotiate your assigned projects. Often this means volunteering for a new project rather than eliminating a project your manager has assigned. But, if you truly believe the skill is important to your personal brand development then taking on a new project will make sense. To successfully handle the extra work, you need to consciously balance the effort you expend against each project you’ve been assigned, investing more against the projects where you will learn the most and simply meeting the established standard of performance on those projects that offer limited skill development. Think back to your days in College when you had a heavy course load in a semester. To be successful, you decided which courses were going to take a lot of your time or were most important to master and which you’d use to balance the workload. What if my current assignment is a mismatch with the skills I want to develop? This situation happens, but is less frequent than you might believe. Sometimes it is simply a matter of being more strategic or creative in thinking about your current assignment and the skill development opportunities it presents. For example, while I was working at P&G, I never understood why many of my colleagues were not taking full advantage of the amazing expertise available in the company to improve their understanding and mastery. They would put their proverbial nose to the grindstone to complete their projects as quickly as possible. I always looked at the situation as analogous to being a student at a University with some of the world’s best professors available to learn from. I made it a practice of reaching out to those experts no matter where they were in the company. I’d meet them for coffee and would learn directly from them whenever possible. I’d use my project assignments as the reason for initiating the meeting, and I never found an expert unwilling to share his/her experience to help me be more successful in executing my project. All it took was for me to be proactive and a to realize that projects are simply a vehicle for gaining the knowledge and skills I needed to be personally successful. In my opinion, the fair exchange for doing a great job on my projects wasn’t simply a paycheck it also included my personal skill development. But, admittedly, sometimes you are trapped in an assignment that clearly doesn’t allow you to develop the skills you need at the rate you feel is required to remain competitive. For example, if you want to be the world’s best chef and your current assignment is in accounting. You can certainly learn about money management, but you won’t have an opportunity to improve your culinary skill set. If you were back in college and decided the specific degree you wanted was not available, you would typically decide to enroll in a different college that offered the degree you wanted. I believe the same logic applies in your post college years. If you cannot learn what you need to learn for success, or if your learning has slowed to an unacceptable rate, then it is time to consider finding another company where you can get back on track to achieve your personal goals. As I write this, I appreciate how self-centered and egotistical it may sound at first blush. But the truth is that in the end it is all about your personal skill development and application of those skills. These are two things that are in your control. If you purposefully master the skills required for success, you will be more effective in your work assignment and the company will benefit from your increased productivity. You will actually create a virtuous circle by focusing on becoming better in your area of passion. Continual development enables improved performance, which in turn will lead to increased professional responsibilities and the associated rewards. It will also make you more competitive in the open market for an assignment with another company that may accelerate your personal skill development. You win and the shareholders of the company you work for win. My advice is to take advantage of the start of a new year and be purposeful in your personal skill development. View your current work assignment through the lens you used when you were in college. If you picked the right college (company) and are in the wrong courses (project assignments), then negotiate a different set of courses. If you are in the wrong major (job assignment), then try and switch majors. If you are in the wrong college, then apply to and get accepted in a college better suited to your degree goals. But, whatever you do, start with a clear understanding of your personal brand promise and the skills/knowledge required to competitively deliver against that promise. Proactively manage your personal brand and your professional performance will benefit as a direct result. The hardest step is the first. 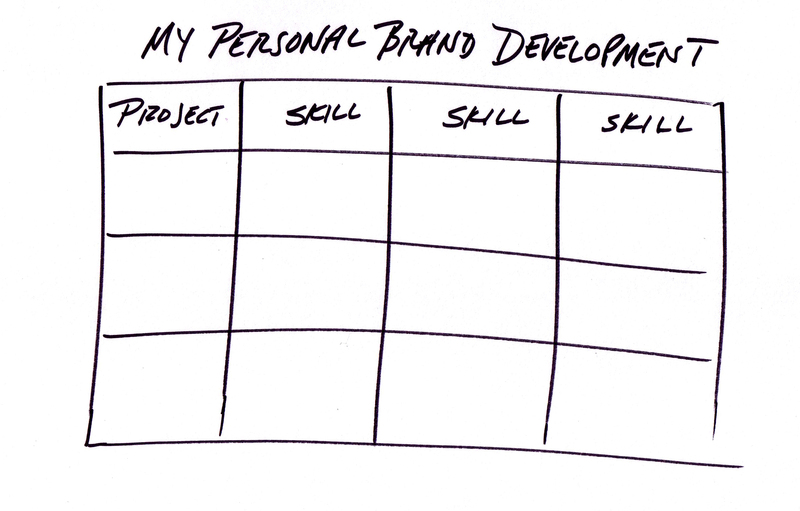 Begin by creating your personal brand development chart and executing against it in the upcoming year. How do you evaluate your personal brand performance? Was there anything that struck you positively or negatively in this blog post? 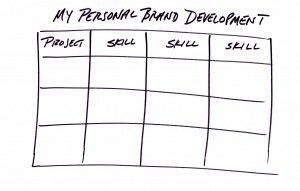 Do you have a personal brand development plan in place? What advice would you give to others on how to determine which skills are required for success?